Nov. 22, 2010 -- It was a less than a week before Christmas -- Saturday, Dec, 19, 1954. Harold Randolph and Grace Elizabeth "Betty" Oilar of Pasadena, Calif., invited some friends, Mr. and Mrs. L.W. McConnell of South Pasadena, over to their home on Avenue 64 for a holiday celebration. 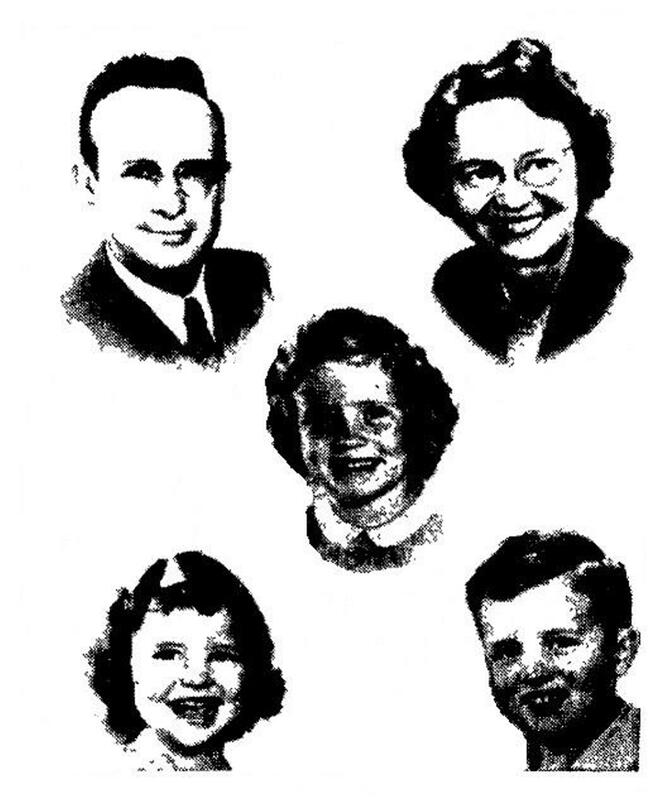 The Oilars had three children -- Raymond, 12; Janet, 10; and Martha, 7. Also at the home that night was one of Martha's friends, Bronwyn Rayburn, who lived nearby and was going to spend the night. The Oilar family and their guests gathered in the living room of the Oilar home and sang Christmas carols, with Betty Oilar playing the piano. The group also walked through the neighborhood, singing Christmas carols to the neighbors. Harold Oilar, 39, was born in Columbus, Ohio, in 1915, the only child of Forrest and Harriet Oilar. Shortly after Harold was born, the family moved to Little Rock, Ark., where Forrest Oilar worked as an auto distributor. In 1927, the family moved to Long Beach, Calif., where Forrest Oilar managed a drugstore, and Harriet worked as a cashier. Betty Oilar, 39, was born in Colorado in 1915, the daughter of Raymond and Christina Whitlock. Her father was a construction contractor, and she was the second of four children. Harold and Betty met while they were attending Bible college in Chicago. 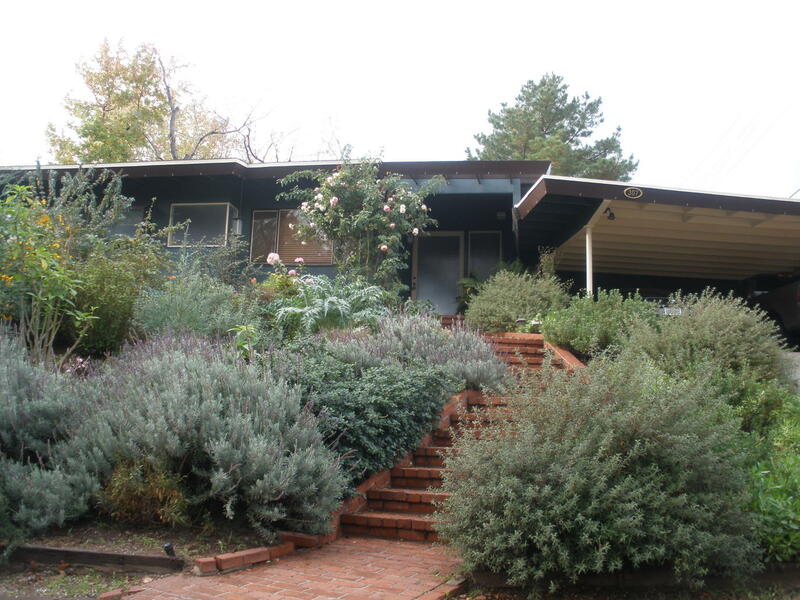 She moved back with him to Southern California, and Harold Oiler went into business with his father selling rugs in Alhambra, Calif., while Betty taught Sunday school. Harold Oilar remained interested in religion and psychology, and wrote extensively on the topics, hoping to have a book of his work published. At some point during the holiday celebration, while the family and friends were singing Christmas carols in the living room, Harold Oilar went out to the garage and brought in his son's Boy Scout axe, and hid it under his bed. Oilar bought the axe several years before to take with him on camping trips, and he always kept it razor sharp. He also took the manuscripts of some of the books he had been writing on psychology and religion and burned them. At about 10 p.m., after their guests had left and their children were in bed, Harold and Betty planned to listen to the news, but Betty was tired and went to sleep. Harold decided to read. He picked up a copy of "Man Against Himself," by Dr. Karl Menninger, a study of suicide and self-directed violence, first published in 1938. As a student of psychology, Harold had read the book before, and it contained his penciled underlinings of significant passages. After reading for a while, Harold went to Janet and Martha's bedroom. He awoke Martha's friend, Bronwyn Rayburn, and carried her out to the glassed-enclosed porch next to the kidney-shaped swimming pool in the back yard. He told her to sleep there. Next, he took the family's cocker spaniel, Scooter, out to the back yard. He returned to his bedroom, retrieved the axe, and attacked his wife. After killing her, he killed his son and two daughters in their rooms. Harold then took between 25 and 30 sleeping pills, locked himself in the bathroom, and turned on the gas. Rayburn took his daughter home, then returned to the Oilar house, where he found a note tacked to the door between the back yard porch and the house -- "Go home," the note read. "Do not go in the house. Go home and tell your daddy to call police." Rayburn called the Pasadena police. Officer Jim Rasmussen responded, kicked in a side door of the house, and found the two Oilar girls sprawled across a bed in their bedroom, their heads wrapped in blankets. Rasmussen then smelled gas fumes seeping from the locked bathroom door. He kicked in the door, and found Harold Oilar sprawled on the floor against the wall, with the bloody axe next to him. Oilar had rigged an elaborate chain and padlock device to anchor himself to the plumbing in the room, but the padlock was not attached to the chain. Other police officers arrived at the scene, and summoned medical assistance. Dr. Glenn Blackwelder, a physician at the Pasadena Emergency Hospital, described the scene as "the most terrible thing I've ever seen. I only made sure they were dead and then left the house." Several notes were found scattered throughout the house -- "Only God could understand, only God could forgive"; "Everything is helpless and hopeless"; "This the only release. They are with God"; and "Sell out everything to pay the debts." After he was taken into custody, Oilar gave a complete statement to police, admitting his role in the slayings and taking full responsibility. "It can't be real," he said. "I've had a bad dream. I murdered my wife and kids." While Oilar was being held at the General Hospital prison ward, he raised more questions than he was able to answer. "I want to know why," he said. "Why would I destroy the only things I love in this world, the only things I value? Why? Why?" "I know it's true," he said. "It's true, it's true. My lawyer told me that it's true and I believe him. It's not a dream. It's true. My only defense is to get out of this world and make room for normal people. I only have one thing in mind. I want to die. The only thing I'm waiting for is to pay the maximum penalty for this thing. I want to pay that price." "There is no answer unless maybe God knows an answer," Oilar said. "I had problems, certainly, but this was an overwhelming way to solve my problems." Oilar's problems included financial difficulties with the rug business. "We had been living on a razor's edge," Oilar said. "We started with nothing and we aimed for the stars." 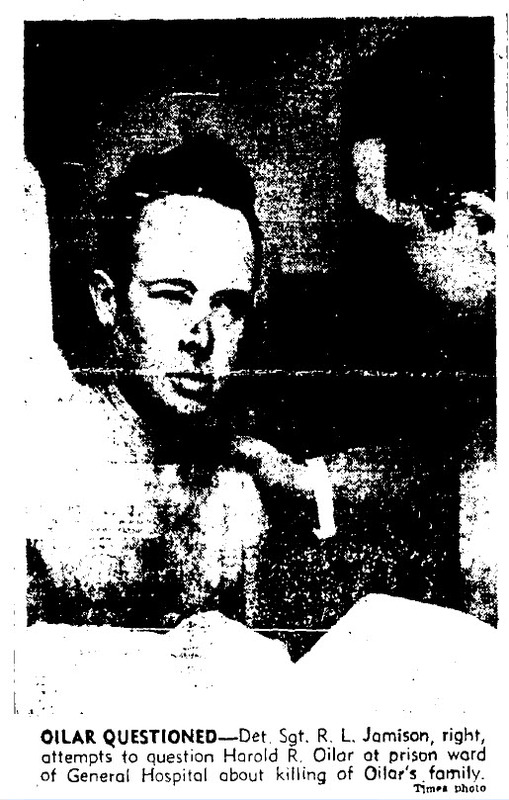 Police records also revealed that Oilar had been arrested twice before -- in 1938, for indecent exposure, and in 1953, as a peeping Tom. Both times, he was sentenced on misdemeanor morals charges, and was ordered to undergo psychiatric therapy. The funeral services were conducted by Robert Rayburn, the Oilars' friend and neighbor from Pasadena. Although Harold Oilar was still being held in the General Hospital prison ward, police and hospital officials said he was well enough to attend the funeral service, but he did not ask to attend. During the funeral service, Rayburn said, "Our hearts go out to Harold Oilar for the salvation of his soul and the repose of his spirit." Oilar was arraigned on four murder charges on Dec. 28, and indicated that he planned to plead not guilty by reason of insanity. However, three psychiatrists who examined Oilar determined that he was sane at the time of the murders and, at a court hearing on Feb. 3, 1955, Oilar pleaded guilty to all four murder charges. On Feb. 14, 1955, Judge Kenneth C. Newell sentenced Oilar to death in the gas chamber at the state prison at San Quentin. "This is one of the worst cases in my experience as a judge," Newell said. "There is no question in my mind that the defendant planned the crime down to the minutest detail." Oilar was sent to San Quentin on Feb. 19 to await the setting of his execution date. But on March 21, 1955 -- the day which would have been his wife's 40th birthday -- Oilar hanged himself from an air vent in the rear of his cell, using three hand towels he had hidden. Harold Oilar was also buried at Westminster Memorial Park, next to his wife and children. 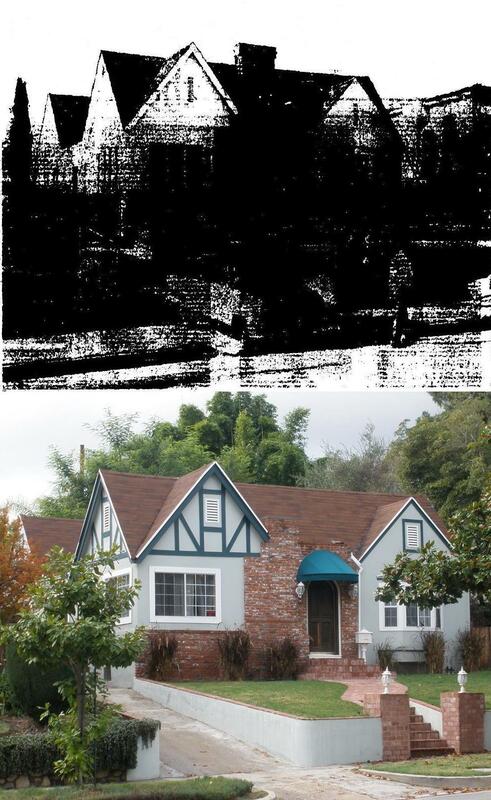 The home where the slayings took place looks much the same today as it did in 1954. 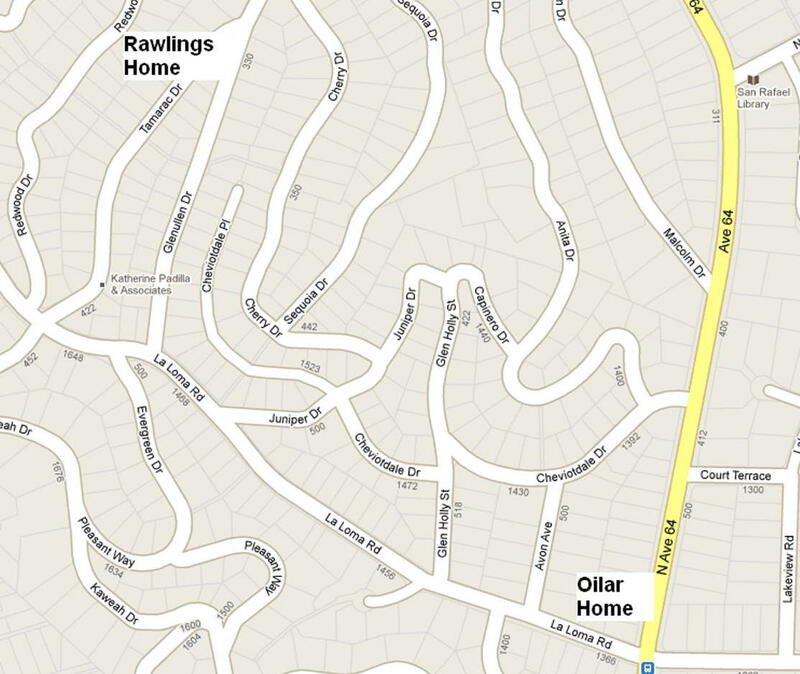 Less than three years later, in a chilling repeat of the Oilar family holiday slaughter, a prominent Pasadena attorney killed his wife, two children and himself in their home on Tamarac Drive, less than a half-mile from the Oilar home. On Tuesday, Nov. 26, 1957 -- two days before Thanksgiving -- at about 4:20 a.m., Harvey F. Rawlings bludgeoned his wife, Marjorie Ruth Rawlings, into unconsciousness with a ball-peen hammer. He then went down the hall and shot his son, Raymond, 12, in his bed. The shot apparently woke the Rawlings' eldest son, Robert, 16. As he was getting out of bed, his father came in to his bedroom and shot him. Robert's body was found on the floor next to his bed. Mrs. Rawlings apparently regained consciousness, and went down the hall to Raymond's bedroom. As she came out of the room, Rawlings shot her twice in the head. Rawlings then went into the bathroom, and shot himself between the eyes. Like Oilar, Rawlings was beset with financial difficulties. Friends told police that Rawlings had been under tremendous pressure to pay off debts incurred through bad investments, and the family faced the prospects of a bleak Thanksgiving. But the friends also told police that Rawlings' financial situation had been improving in recent months. And, like the Oilar family, the Rawlings family was described by friends and neighbors as a seemingly happy, normal family. 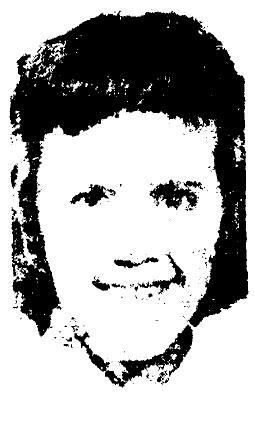 Bronwyn Rayburn, the family friend who was carried outside by Harold Oilar, moved to Missouri with her family shortly after the slayings. She married a military chaplain, and wrote literature for Bible schools and children's church literature for more than 20 years. She died of cancer on Sept. 29, 1996, at the age of 49 at her home in Florissant, Mo. She's buried at the Jefferson Barracks National Cemetery in St. Louis. Bronwyn's father, Robert G. Rayburn, died in Missouri on Jan. 5, 1990, at the age of 74.